Description: This is a set of 3 Original Little People western figures. 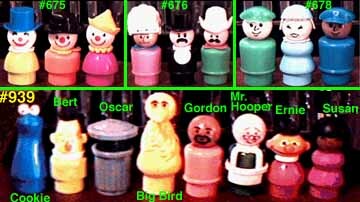 These western figures can be played with alone, or used as added accessories to the #934 Western Town set. Although the #934 Western set was sold with an Indian figure, the Indian sold with this set is colored a little bit differently. The Mayor figure is a nice accessory because the Western town was never sold with a Mayor....but should have been. The Mayor, Cowboy, and Indian were sold exclusivly in this set. NPP - Tall black body mayor with a thick moustache, wearing a black top hat, and white bib collar on his chest. BMPP - Tall green body man with a thick black moustache, and wearing a white 10-galllon cowboy hat, and a red non-triangular scarf around his neck. PEPP - Red body Native American with a white "feathered" headdress that has red markings on the forehead, and a blue scarf around his neck. He does not have a printed breastplate on his chest. BMPP - Tall green body man with a black moustache wearing a white 10-galllon cowboy hat, and a red non-triangular scarf around his neck. DIPP - Light red body Native American with a white "feathered" headdress that has blue markings on the forehead, and a blue scarf around his neck. He does not have a printed breastplate on his chest.